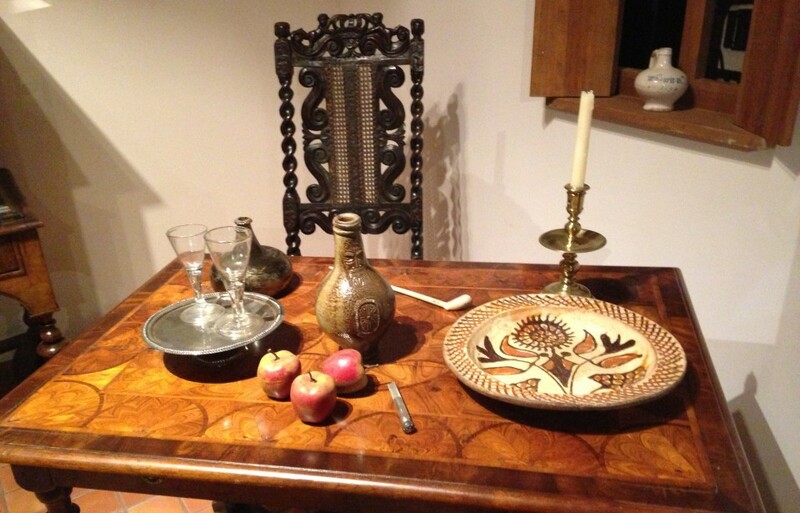 Cooks in the 19th century share a common dilemma with modern cooks… what to do with the leftovers! This recipe was likely intended as a way to serve leftover beef as a second meal, in a new form. Curried Beef appears in “Mrs. Beeton’s Book of Household Management”, published in 1861. Isabella Mayson Beeton spent several years writing the book, giving advice on all manner of subjects related to running a Victorian English Household, from tipping the servants to the proper way to bake bread. Cut up the beef into pieces about 1 inch square, put the butter into a stewpan with the onions sliced, and fry them of a lightly-brown colour. Add all the other ingredients, and stir gently over a brisk fire for about 10 minutes. Should this be thought too dry, more beer, or a spoonful or two of gravy or water, may be added; but a good curry should not be very thin. Place it in a deep dish, with an edging of dry boiled rice, in the same manner as for other curries. In a stew pot, melt the butter over medium heat. Form the ground chuck into small balls, no bigger than an inch in diameter, and fry them in the butter, placing a cover over the pot, for about 7-10 minutes. Take care when you turn the meatballs that you not to allow them to break apart (a spoon works best). They should not be fully cooked! Drain meatballs on paper towel and set aside. Fry onions in remaining butter and beef drippings for about 10 minutes. Also add in the curry and stir until mixed thoroughly. Carefully put meatballs back in pot, simmer about 10 minutes. That’s it! I served it with white rice. My daughters and I love curry but if you’re wary of the spice, you can reduce the amount to one teaspoonful. For me, that wasn’t spicy enough. This is an easy dish for weeknights-and yet slightly exotic… so you won’t feel like you’re serving the same old stuff. Enjoy! Let me begin by saying that if you love olives, this recipe may be highly disappointing. However, if you love beef stuffed with bacon, then smothered with gravy, you’ve come to the right recipe. 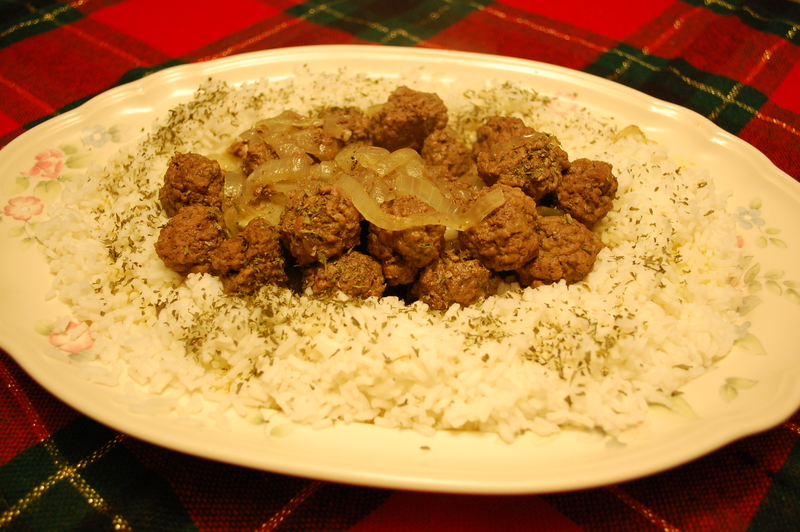 There are about a thousand different variations of the vintage Beef Olive recipe. Some have veal or pork stuffed into the beef-which sounds yummy and I might try it at a later date. But I picked this one because, frankly, I had beef and I had bacon! 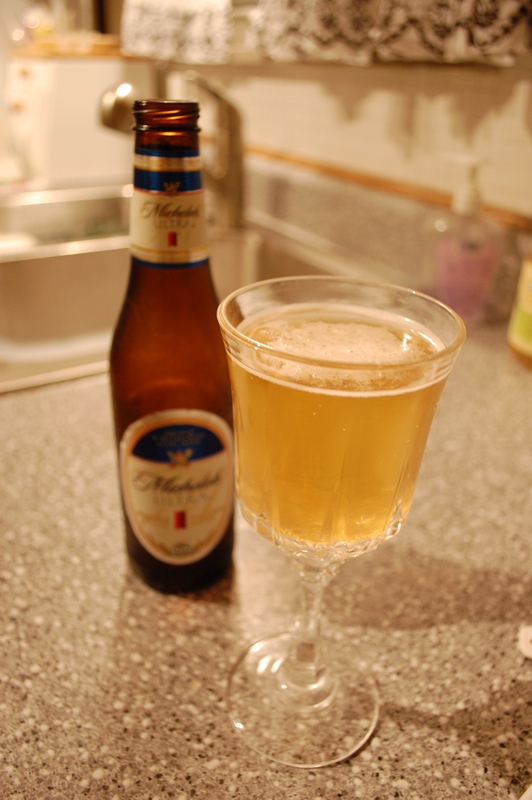 Also, I knew my husband would love it-and so would every other guy reading this blog. This recipe comes from “The Virginia House-wife” by Mary Randolph, first published in 1824. I hope to get my hands on a copy in the near future. Mary Randolph’s volume was considered the most influential housekeeping book of the 1800’s. Incidentally, she’s also the first recorded person to be buried at Arlington National Cemetery. 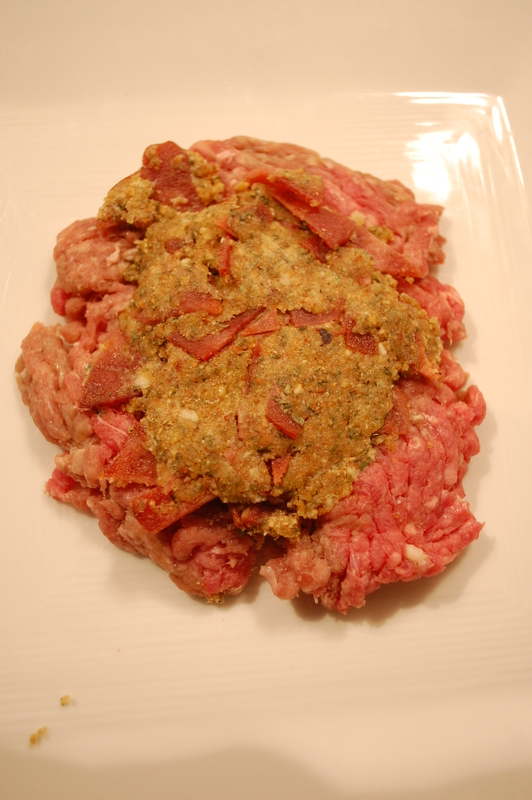 Cut slices from the fat rump of beef, beat them well with a pestle; make a forcemeat of bread crumbs, bacon, parsley, onion, suet, mace, pepper and salt; mix it up with the yelks, and spread a thin layer over each slice of beef, roll it up tight, and secure the rolls with skewers, set them before the fire, and turn them till they are a nice brown; have ready the gravy, thickened with brown flour and the butter, red wine, with the mushroom catsup, lay the rolls in it, and stew them till tender; garnish with forcemeat balls. Don’t you love how she writes egg “yelks”? I didn’t have a rump of beef lying around-but I did have a package of hamburger, and most of the other ingredients. 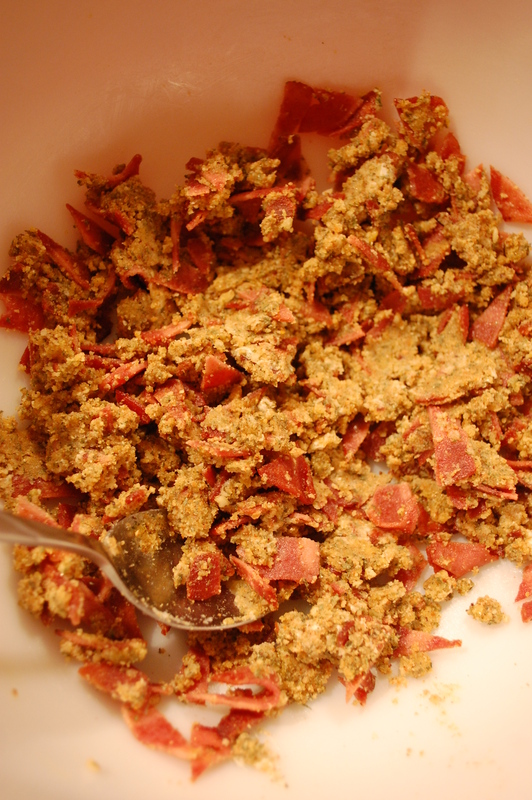 I did some experimenting with the forcemeat, as there are no measurements recorded by Mrs. Randolph. I’ll also use this recipe to introduce you to mace-not the chemical spray used to ward off bad guys-but the spice made from the dried covering of the nutmeg. You’ll find it at most big-name grocers. It’s a necessity in the vintage kitchen, as it was one of the most widely used spices in recipes written before 1900. Roll the ground chuck up and place it in a skillet, sprayed with cooking oil, on medium heat. Repeat until you’ve used up all the ground chuck-you should have about eight patties. Fry the patties until brown on each side, taking care when you flip them not to let them fall apart. Flatten the patties again with your spatula. 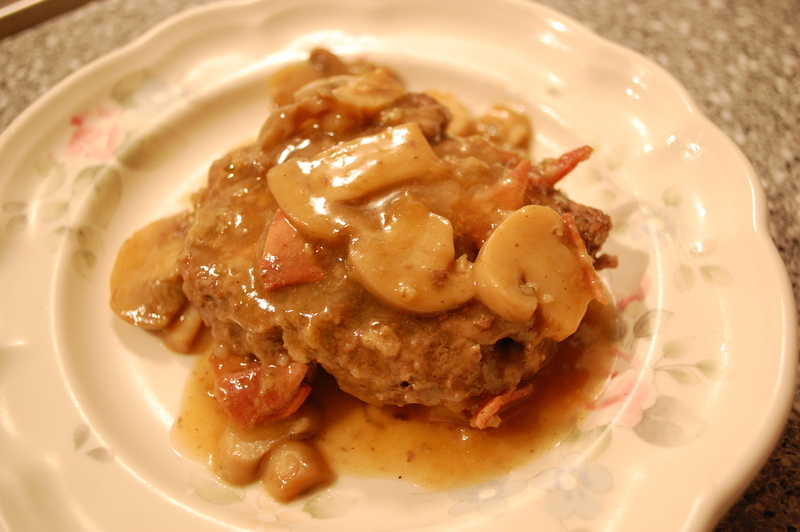 While the patties are browning, mix the gravy, mushrooms, and wine in a medium bowl. 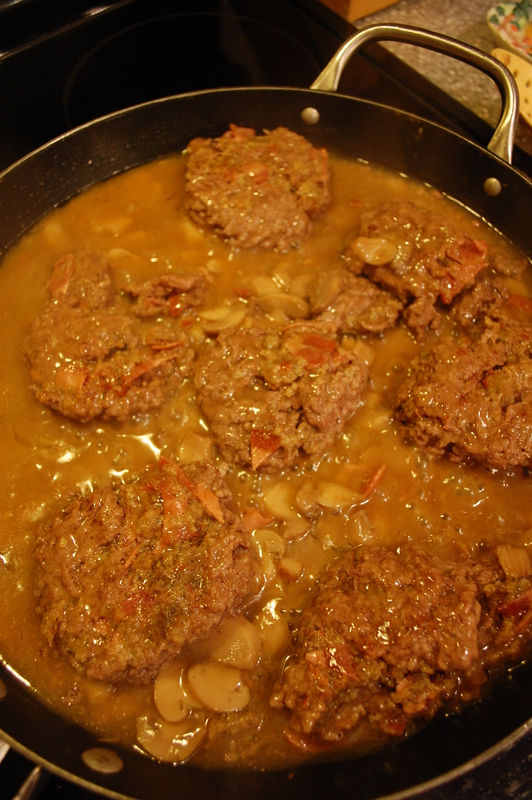 When the patties are brown, drain the fat from the skillet and then pour the gravy mixture evenly over the patties. Cover the skillet and let simmer on low to medium low for about 20 minutes, until the meat is no longer pink. Serve with a spoon of gravy (or more!) ladled over each patty. As you can imagine, this was a big hit with my husband. I served it with potato fritters-also smothered in gravy from the beef olive pan-a salad, and a slice of bread. It’s a step up from your ordinary hamburger or meatloaf meal and it was easy and quick to prepare-perfect for busy weeknights. To make it easier, fry some extra bacon one morning before school-and set it back for this dish. Enjoy! Next blog post: My very first bread-and an introduction to my new best friend in the kitchen.